I have been asked a number of times by parents about what they should work on with their children after they have mastered ABC recognition and letter sounds. The next step is putting together the sounds to form small words and this is easily done by building word family recognition. Here is a link to a word family list at a favorite website of mine, www.enchantedlearning.com. Word families are basically common word endings that become new words by switching out the beginning letter/s. Concepts and skills like this are easily turned into My Obstacle Course station activities. I introduced this with Andrew by using Scrabble or Bananagram letters, letter blocks and letter magnets to build this knowledge, allowing him to see how the word changes easily by replacing the first letter. As he got older, I used some calendar cutouts and created a word family sort. When he got to the station, he sorted the words, put them with their correct endings. He read the words out loud while sorting. 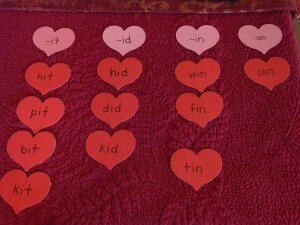 If your child is ready for this skill but is not speaking yet, you can read the words out loud for them while they sort them. This helps give an auditory component to this activity so all learning modalities are used (visual, auditory and kinesthetic). 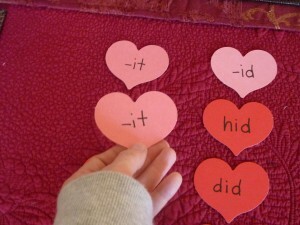 Another Self-Checking Activity: I wrote the endings on the back of the cutout in order to make it a self-checking activity. Once the sort is complete, turn the cutouts over to make sure they match the ending on top. Since spelling or word patterns are usually how students are taught in school, this is a great way to reinforce something they are already working on. You can adjust this activity to fit with whatever skill level your child is ready for. Turning it into more of a game doesn’t take long and doesn’t have to be fancy but it sure helps to make practicing this skill more fun and engaging. Calendar cutouts are always on my list of things to get for My Obstacle Courses. They are so helpful when working on different academic and developmental skills at home. Instant theme and so versatile! My favorite cutouts are from Creative Teaching Press. They are about the thickness of an index card and have a different color on each side. Click here for the direct link to the calendar cutouts on their site. I also get them at my local teacher supply store.